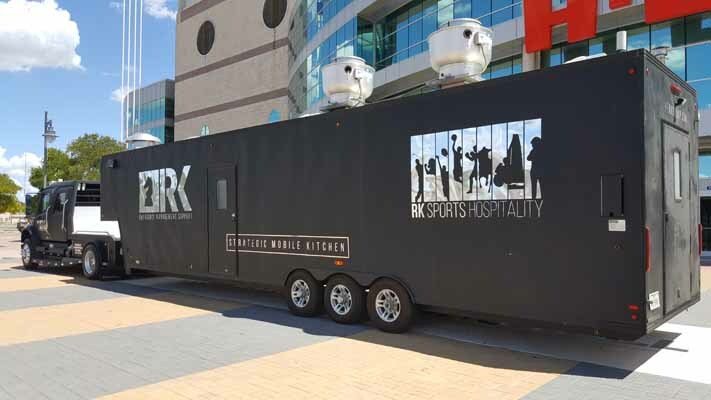 Our 44-foot mobile kitchen trailer is a strategic mobile kitchen custom-designed for the diverse needs of varied deployment missions, containing industrial-scale equipment for food cooking production, preparation, and cold storage. The vehicle’s production equipment includes numerous ovens, a 6-burner range, griddle, car-broiler, fryers, tilting skillet and pan steamer onboard. Want to rent our 44' Mobile Kitchen Trailer?